Preheat oven to 180°C/350°F. Zest half the tangerines. Finely slice sage. Remove leaves from cauliflower and cut two thumb-thick steaks from the middle and set aside. Roughly chop remaining cauliflower. Juice all the tangerines and add reserved zest to juice. Add chopped cauliflower, rice milk, and cloves to a small saucepan. Salt to taste. Cook for approx. 15 min. until cauliflower is soft. Remove cloves and puree until smooth with a hand blender. Stir in olive oil and keep warm. In the meantime, heat some vegetable oil in a large ovenproof frying pan. Fry cauliflower steaks over medium heat for approx. 4 - 6 min. on each side until nicely browned. Sprinkle with sage and anise. Transfer cauliflower steaks to preheated oven and bake at 180°C/350°F for approx. 15 – 20 min. 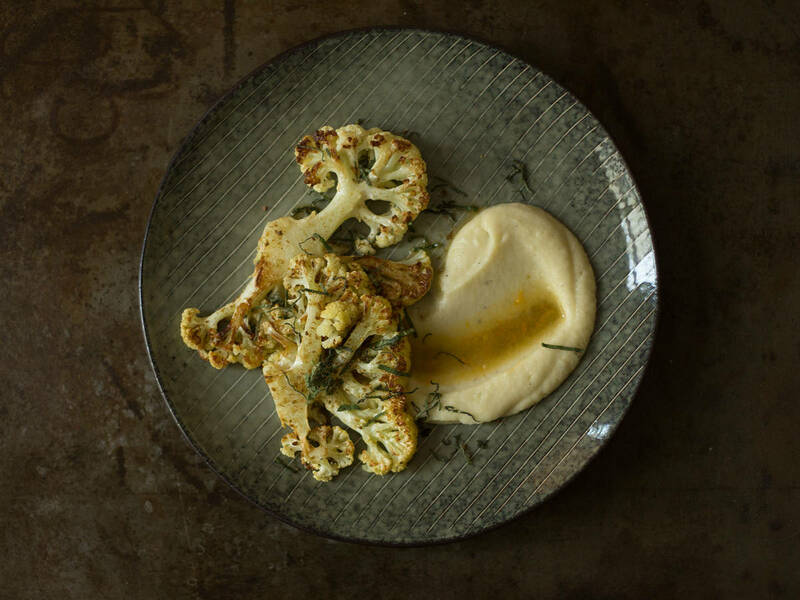 Serve cauliflower steaks on a bed of cauliflower puree. Drizzle tangerine juice over cauliflower steaks. Salt to taste and enjoy!